The #1 New Age Album on Amazon for almost 2 years! It has been said over the centuries that all of the teachings of the Buddha are contained in the simple mantra of Om Mani Padme Hum. The purpose of this album is to raise collective vibrational frequency. This music is a tool for that purpose. We accomplish this by using each piece as a foundation for your personal meditation practice. #1 on Amazon!! Notice the #7, #8 and #10 spot. 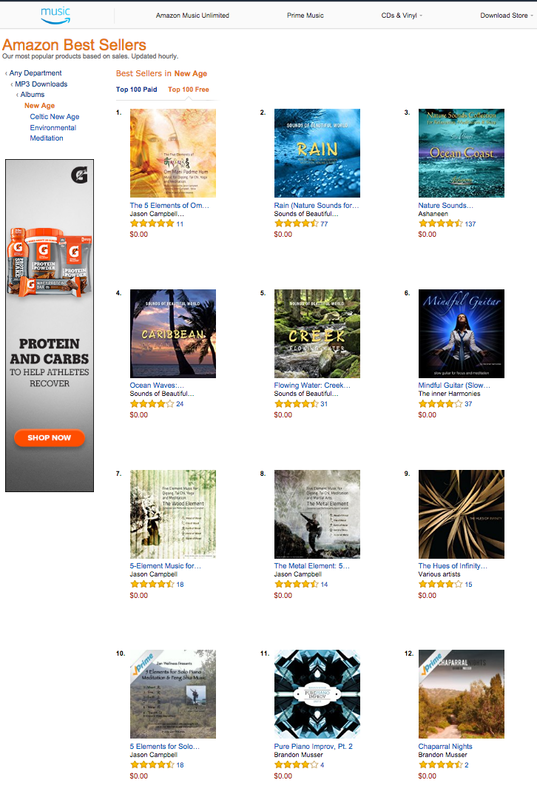 4 of my albums in the top 10 at once! A simple way of using mantra in your meditation is to repeat the words over and over. Initially, this technique works to keep other thoughts out of your head, then evolves into understanding meaning through stillness. These songs tell the story of the five elements. The ancient masters observed recurring patterns in nature, medicine, music, human affairs, and other parts of nature and life’s expression. They categorized these observations into the five phases, or elements. Each one has its own attributes, tendencies, strengths, and weaknesses. Wood element: rising, spring time, sprouting upwards. The color is green. The syllable is Om. Fire element: rising and dispersing. Picture flames flickering and dancing. The color is red. The syllable is Ma. Earth element: centered and sweet. It does not rise or fall much, always returning the center. The colors are yellow and gold. The syllable is Ni. Metal element: splitting and falling. The season is autumn, and there is grief in the metal element. The colors are white and silver. The syllable is Me. Water element: flowing, building up and dispersing. The season is winter. The colors are blue and black. The syllable is Hum. Qi: sometimes referred to as the 6th energy. Similar to fire, this energy dances both upward and downward. The color is purple. The syllable is Pad.